SUSTEC DF210. Super Low Down Form. The Perfect Drop. An Ideal Balance. The DF210(DF stand for Dress-Up Form) coil spring offers a large drop, while retaining superb ride quality characteristics. 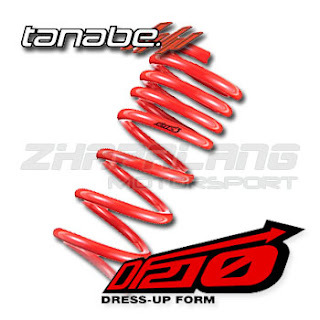 The spring rate is raised 10-15% to compensate for the shortened amount of suspension travel, without over-stiffening the spring rate and affecting ride quality and shock lifespan. The DF210 is unique in that it provides an excellent range of benefits, from it's extremely low stance, to performance and comfort. Overall, the DF210 is extremely well balanced for those looking to lower their car, increase handling potential, and maintain comfort. For those who want the lowest drop.